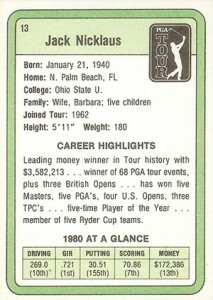 It might seem hard to believe, but the first set of of modern golf cards didn't arrive until the 1980s. 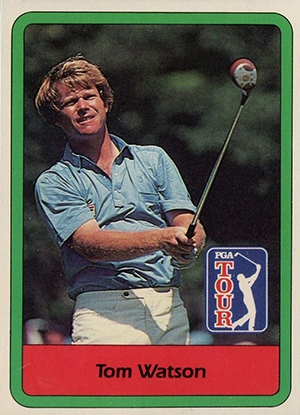 While golfers appeared on the occasional card here and there, 1981 Donruss Golf broke the mold, delivering a full set of traditional cards dedicated to the best the PGA had to offer. As a result, the checklist is loaded with rookie cards from several greats and all-time legends. 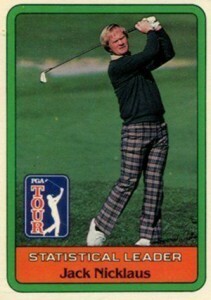 The 1981 Donruss Golf checklist has a total of 66 cards. It breaks down to 60 numbered golfer cards and six Statistical Leader cards that aren't numbered. The Statistical Leader cards are usually packaged with the base set. Card fronts are very simple. A white border gives way to a green frame with rounded corners. Colorful action shots are accented by a PGA Tour logo and orange nameplate at the bottom. Backs are green and white and come with a lot of vital stats. Brief career highlights and 1980 stats round out the informative details. Because it's the first modern set of cards for the sport, all numbered cards in 1981 Donruss Golf are considered rookie cards. Leading the checklist is the legendary Jack Nicklaus. Other highlights include Tom Watson, Lee Trevino and Tom Kite. Readily available, 1981 Donruss Golf remains extremely affordable. 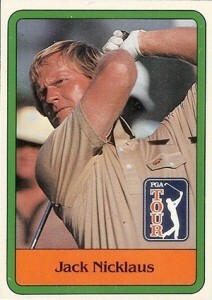 Raw copies of the Jack Nicklaus rookie card can be found for under $20. Even graded copies in top condition are relatively affordable given his iconic status in the sport. Centering is an issue on a lot of cards and definitely something to consider when purchasing 1981 Donruss Golf. It's very common to find cards that are visibly off center, even at a glance. 66 cards. Five Statistical Leader cards and one checklist are not numbered. All numbered cards (#1-60) are considered rookie cards. 1981 Donruss Golf Unopened Wax Box - Jack Nicklaus RC Possible - NICE!